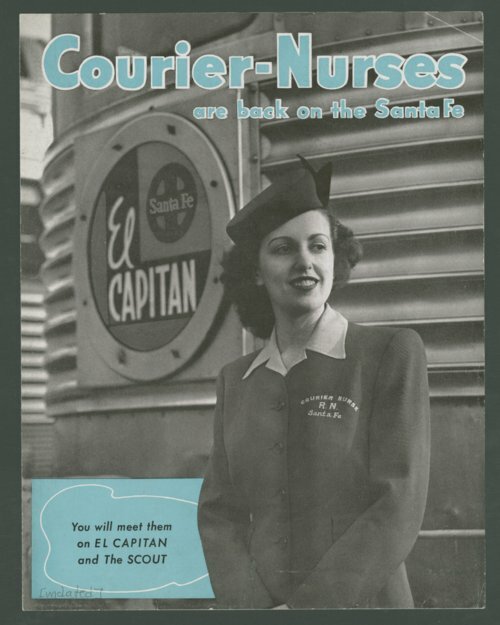 This flyer published by the Atchison, Topeka & Santa Fe Railway Company promotes the return of the courier nurse to the passenger trains of the El Capitan and the Scout. The Atchison, Topeka and Santa Fe Railway Company assigned registered nurses, known as couriers, to their passenger trains prior to World War II. With their return in 1947 the nurses resumed their responsibilities of attending to the medical needs of passengers and assisting with certain administrative duties or errands that required attention.